So I went downstairs the other day. Yes, Virginia, there is a downstairs! And, whoa, I was kind of blown away (not an easy trick for a creature who spends his time in wind). I have long known and often taken advantage of River City Books’ bargain basement, finding great books for cheap-cheap-cheap. It has been the answer for me countless times, whether I was after gifts for friends or gifts for, well, yours truly. But what they’ve done down there recently is really freaking cool. They’ve brought in some vertical bookshelves, slid in a bunch of additional tables and filled them all with novels, poetry, reference books, books for kids, DVDs (so many low-priced DVDs! ), histories, mysteries and more, more, more! Literally, the store’s inventory expanded by some factor that is beyond my facility with numbers. (A bird who writes … and you expect math, too?). The revamped bargain basement is so impressive it has shifted my entire plan when I zip through River City Books’ front door. Used to be I would go downstairs only after a spell browsing the tables up top. No longer. The basement is now the penthouse — the first place I look for books. Especially when I have my holiday shopping list tucked under my wing. I can’t believe it, but another day, another big book event. Here’s the skinny: Harmon Leon, author of The American Dream: Walking in the Shoes of Carnies, Arms Dealers, Immigrant Dreamers, Pot Farmers, and Christian Believers, will read from and sign copies of his book at 7 p.m., tonight (Nov. 24) at the Contented Cow. The event, which is free and open to the public, is co-sponsored by the old neighborhood bookstore. The book is on sale for 15 percent off through the event. Copies will be available for purchase at the Cow. I happened to catch most of Karin Winegar’s appearance at River City Books yesterday afternoon — and I am glad I did. Winegar, author of Saved: Rescued Animals and the Lives They Transform, read from and signed copies of her heartening book while one of the rescue dogs (see above photo) looked on with approval. Winegar shared slices of some of the compelling stories in “Saved” (I, for one, was happy to hear about kind people who reach out to animals in need). She also displayed several of the amazing photographs in the book. If there’s an animal lover on your shopping list I don’t know why you would need to look any further! One more thing to note: Ms. Winegar was kind enough to sign a few extra copies for the store. Those are on sale while supplies last. Hey, if you want to pick up one or more of these award-winners, I know you know where to go. I stopped by River City Books last night and found there wasn’t a spare seat to be found, as popular novelist Lorna Landvik discussed her new holiday book and her latest paperback release. 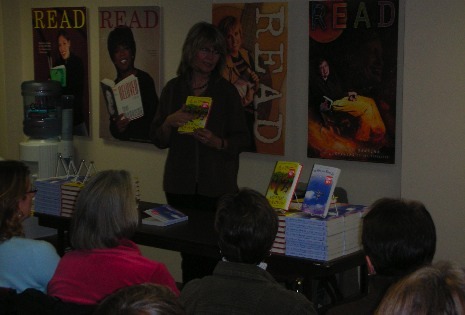 Readers packed into RCB’s cozy downstairs meeting area to listen to Landvik, who read from both books, and pick up signed, discounted copies of those and other Landvik-authored titles. Many authors struggle to present their material — but not Landvik. A trained stage performer, she adds wit, unique accents and colorful personality to her characters’ voices. And she’s especially comfortable telling stories — whether or not those stories come from one of her books. If the idea was to make people laugh … I know I was not the only one chuckling! I was checking out the River City Books‘ bargain tables — there are so many these days (more on that soon) — and I had a flashback. To last Friday. Let me explain: Shannon Olson was one of the talented female writers who contributed to Riding Shotgun and appeared during Northfield Reads! last week. Well, Olson’s first two novels, both winners, the second a sequel to the first, were sitting there in front of my beak! That’s right. Welcome to My Planet and Children of God Go Bowling are both currently on sale at RCB for $6.99 each. The Star Tribune has called these novels “Fiercely funny” and “a testament to Olson’s significant talent.” And both can be had for under fifteen bucks. That’s the kind of flashback I like to have (as opposed to those I had in college).